For more than two decades, the Windows PC has dominated the enterprise computing landscape as the main productivity tool for knowledge workers in every industry. In the past few years, however, modern mobile devices have started to change the enterprise IT infrastructure — and the model of device management and security along with it. Today, end users are no longer exclusively tethered to a desktop. They work on a variety of devices — mobile and desktop, personal and corporate-owned, locked-down and securely enabled. As a result, the traditional legacy management tools that have been so useful in protecting Windows PC resources are no longer adequate to securely manage this rapidly changing environment. Top industry analysts have already noted that enterprises should move at least some their endpoint management workload to enterprise mobility management (EMM) platforms. 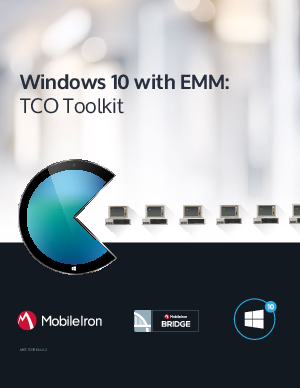 Read this whitepaper to learn how using EMM to secure and manage your PCs can significantly reduce total cost of ownership by up to 80% across three key areas such as IT operations, helpdesk administration and licensing costs.